Traditional yogurt is made of dairy milk inoculated with bacteria to give the thick, creamy texture of a yogurt. In vegan yogurt, the dairy milk is replaced with a plant based alternative. By using the right combination of functional ingredients that are adapted to the process, the same texture of a dairy yogurt can be achieved at different fat levels. At KaTech we manage to achieve the right texture for products that are fermented or alternatively acidified, fresh or thermised for longer shelf-life at different fat and protein levels. We give the manufacturers a wide range of possibilities to choose from so they can get the product they are looking for. 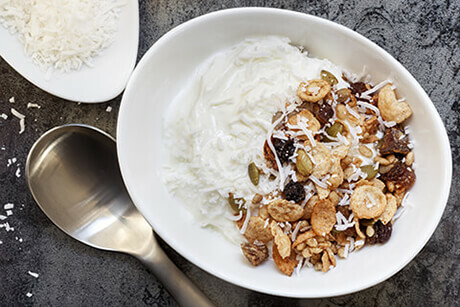 Our latest developments are a range of vegan yogurts made with coconut milk. A fermented and an alternatively acidified version are available in a variety of fat levels. The final product has a very creamy texture, just like greek style dairy yogurt. The stabilizer allows the addition of fruit preparations as well, if desired. As a fresh product, it has as shelf life of 4 to 6 weeks, thermised up to 6 months or longer. If you are interested in coconut milk yogurt or other technologies using vegan milk alternatives, please get in touch with us. At KaTech our expertise will help you to get the product you are looking for. As the vegan milk alternatives vary a lot in price, KaTech can help to get the right balance in cost and taste that fit the process requirements of the manufacturers. At KaTech we have a lot of expertise to look at optimising costs of recipes, while taking the process and ingredient requests of our customers into consideration.